Equilateral Triangle Shade Sails with Sunbrella fabric is one of our most popular shapes to provide gardens, children's play areas, car spaces, courtyards, pool areas, and even office building areas all benefit from the cool good looks and shade protection from the sun. These sails can be mounted to a variety of surfaces and are easy to install. Now you can create a shaded area anywhere. Sunbrella is a 100% solution dyed acrylic fabric is breathable, provides excellent resistance fo fading in the sun and can weather the elements, to keep you cooler and more comfortable in hot weather. This state of the art material has a 10yr limited fabric warranty, remains nearly unaffected by moisture and natural temperature extremes. Sunbrella fabric is fade and water resistant. The near waterproof fabric also resists stains, mildew and rot. The perimeter of each sail is designed with a webbing for increased durability and a marine grade, stainless steel "Delta" or "D" ring at each corner. Shade sails, when installed properly, do not sag or flap in the wind. The dimensions supplied are for the finished sails dimension, corner to corner along a side. Your mounting points should be at least 11" + 5% of the length of the sail. This is so you have enough space for your typical mounting hardware ( ~11 inches) and the fabric stretch ( ~5% of the length of the side ). 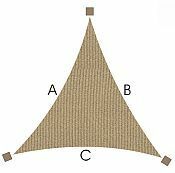 EXAMPLE: 20ft side of sail (240 inches), would require that the mounting points be at least 263 inches apart at a minimum. 5% of 240 inches is 12 inches, add that to 11inches and you get 23 inches + the length of the side of 240in equals 263 inches. Easy right? Due to manufacturing tolerances and fabric stretch, sails dimensions may vary 1.5" plus or minus. Note: Sunbrella material is water resistant, it MUST be mounted at an angle of at least 20 degrees to allow water run off. Please note that all Sunbrella shade sails are made to order and therefore these are NOT returnable. Welded Stainless Steel "D" rings in the corners. Sides are not straight. They curve inwards about 6-10% so it will help eliminate fabric wrinkles, sagging and even flapping when properly tensioned. Acknowledgment: Made to Order, No Refunds or Returns. All Sides have inward curves of 6-10% of the length of the side by design. Sunbrella must be mounted with at least a 20 degree slope for water runoff.